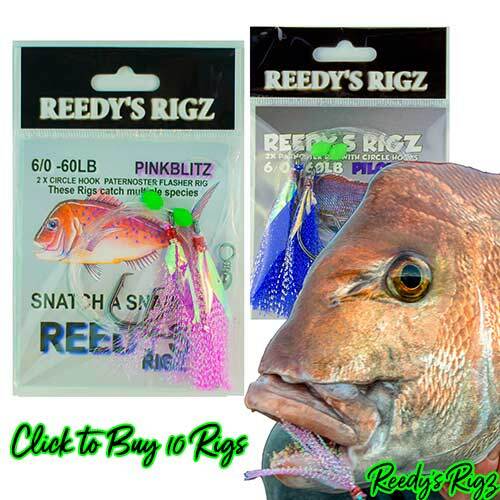 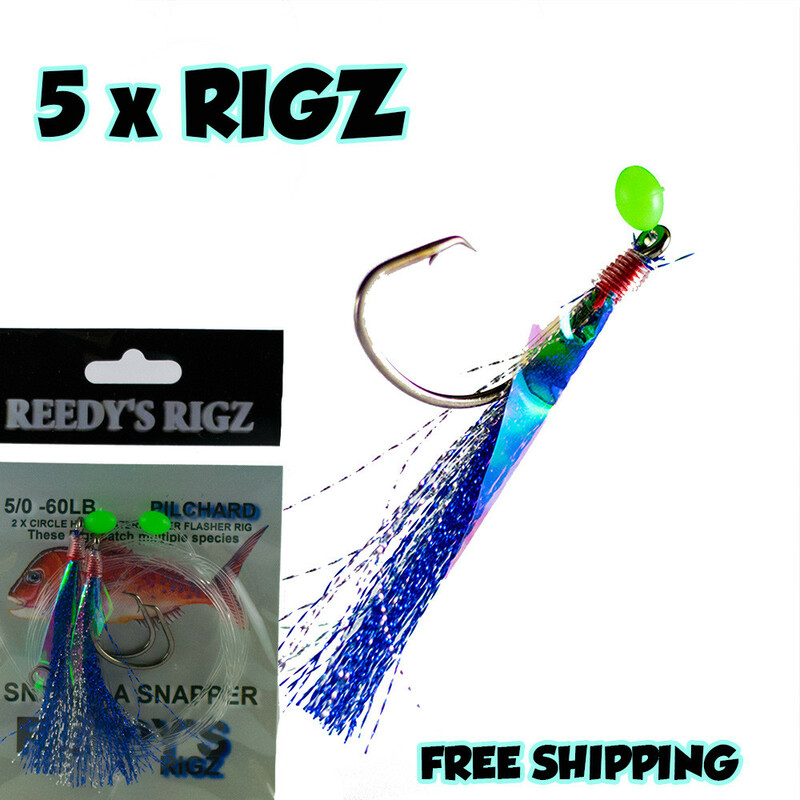 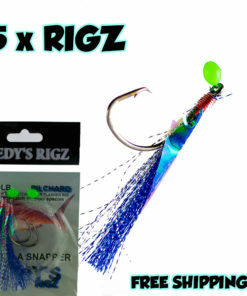 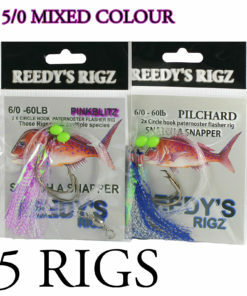 Pack of 5 snapper rigs With circle hooks Choose you color & hook size . 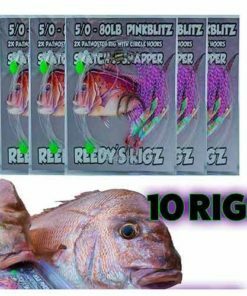 The snapper rig (snatcher ) is rigged on mono leader 60lb on a paternoster assortment with two hooks per rig .hook size’s range from 1/0 through to 8/0 All order’s are shipped on the same business day the cut of time is 2pm . 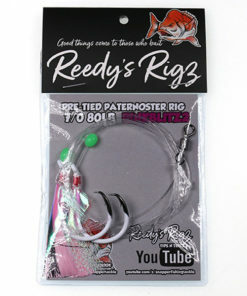 lumo Beads on each hook . 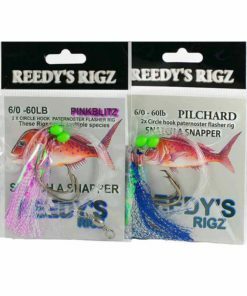 Snapper Rigs and (snapper snatchers)Are a excellent chocie when your fishing for big reds, it’s is really worth using a snapper flasher rig as it may just give you the edge in catching a big red. 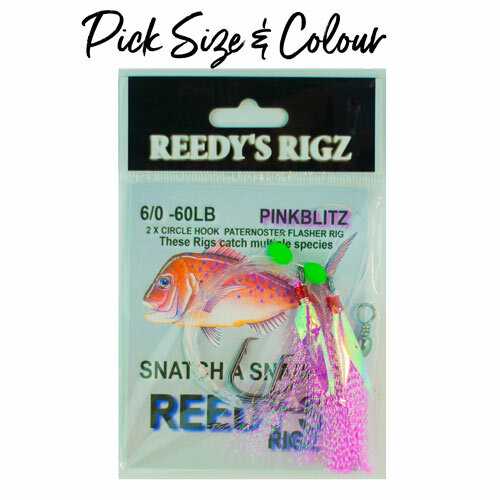 if your fishing from the beach or out in a boat, it is best to add bait & the natural looking lumo flasher rig moving up and down in the water will add to your chance’s of catching a fish. A chunk of pilchard is my favourite bait but all baits work very well squid ,fresh salmon ,tommy’s gar etc .Snapper rigs are great to fish from a pier or jetty but especially in the surf with the lumo flasher washing around in the water they really are a great option for salmon & tailor and any fish you may catch from the surf .if your bait comes loose in the water the flash washing around in the wave’s can double as a lure and we often catch fish with no bait on the hook . 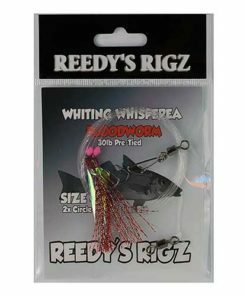 When baiting up, you must make sure the gape of the hook is not covered with bait and the hook is well clear which will make for better hook ups . 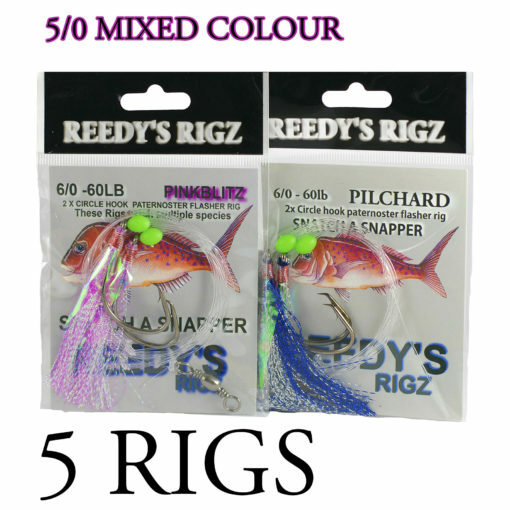 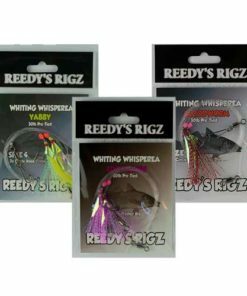 Once you have your rig , baited and it is in the water, sit back and chill out because The circle hooks will do most of the work from here on in as they are designed to hook the fish in the corner of the Jaw as it takes the bait and moves away. 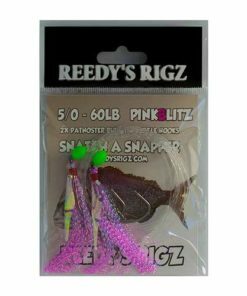 Striking will only pull the hooks, so just dont do it wait till the rod is bent over and a sharp swift lift is enough to hook the fish . 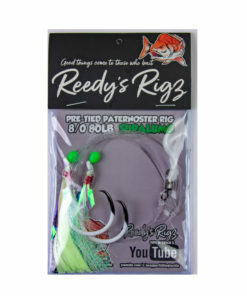 If holding the rod while surf fishing, don’t start fighting the fish until you’re sure the fish is well hooked. 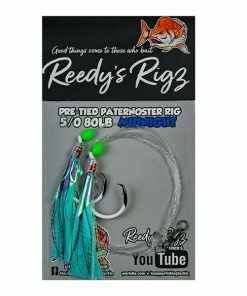 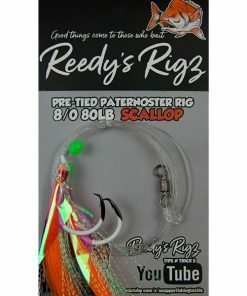 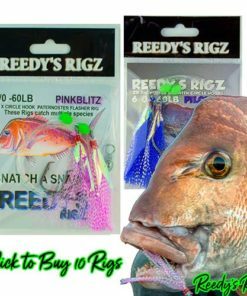 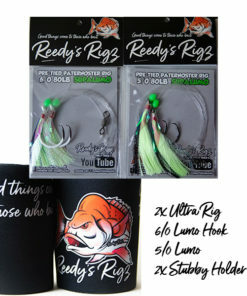 A great way to fish for snapper with Reedys rig’s is directly to the bottom,dont cast it out just drop it down to the bottom . 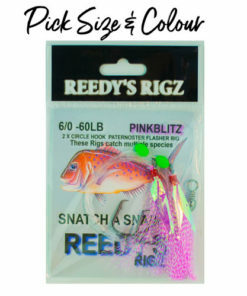 The flasher will wash around in the current and act like a lure and double your chances to catch that big red . 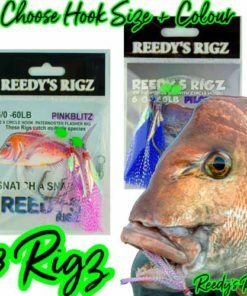 We personally used and tested the rigs in Melbourne Port Phillip Bay, Victoria, but we have had excellent feedback from Brisbane’s Morten Bay, and we have also had many fishing reports from Sydney Snapper scene on the New South Wales coastline. 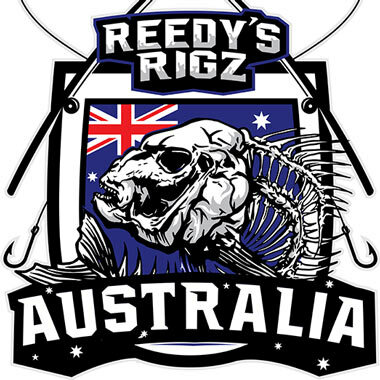 Shark Bay has reported some great Snapper catches over in the west. 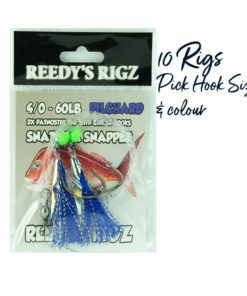 We have sold many to Northern Territory, and down in Tasmania they are selling aswell. 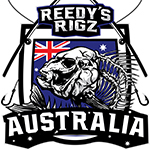 There has also been good reports from Western Port, Victoria and Adelaide’s St. Vincent’s Gulf, South Australia.